Is it possible to utilise the power of your brain, to reach your ideal body weight, to look younger and boost your energy? That’s the question we’re asking today. And it’s the bold claim Dr Daniel G Amen makes in his New York Times bestseller, Change your Brain, Change your Body – the subject of this week’s blog and Changeability Podcast. What’s the idea behind Change your Brain, Change your Body? Let’s unpick this a bit. We’re visually orientated, with our brain devoting half of its processing power to sight. Being visual creatures – how we look, or how we perceive we look, plays a large part in how we feel about ourselves and that can often determine our ultimate success. For our own underlying health – and not just for vanity sake – we should therefore concern ourselves with how we look and feel. And that ultimately, to look and feel your best you need to first think about and then optimize your brain. So as the title suggests, this book is about understanding and optimizing your brain to help you reach your ideal weight, look younger, boost your energy, change how you feel about yourself and that process of changing your body (via your mind) will in turn ultimately determine your success. In essence then, this book is about body/mind integration, mind/body connection and how you can use your brain to improve your body and health. And I’m sure you’ll agree, that’s an interesting premise. But what do we know about the author and how he comes to make these claims? Dr Daniel G Amen is a doctor with three decades of clinical practice at the Amen Clinics. His interest in the brain-body connection started over 30 years ago – where intriguingly he was influenced by an oncologist who taught people to use visualization to boost their immune system in order to fight cancer. At medical school he became trained in hypnosis and saw the effect it can have on healing the body in a variety of treatments. But it was in 1991 that he truly started to understand the mind-body connection when he started doing the brain imaging work which he now does at his clinics. How often do we look in the mirror and see things we don’t always like? We look at our reflection and we see lines on our face we don’t always want there, or we catch a glance of ourselves sidelong and see a tum which frankly we’d prefer not to have. We notice a few split ends in our hair or excessively dry skin on our face. Well, we could make an appointment with a hairdresser for a haircut. The wrinkles – we might slap all sorts of lotions and potions onto the skin to moisturise, cleanse and fill the cracks, so to speak – and some might nip along to their doctors to make an appointment for Botox. Basically we try and fix it ourselves (diet to lose the tum) or get some professional help. We address the effect. But Dr Amen would say that we need to address this issue by thinking about the health of our brain, the cause. And that many of us are walking around with brains that could do with some serious help, but we don’t know it, so we don’t do anything about it to address the issue. The things we see in the mirror are symptomatic of our brain health and instead of addressing the causal symptom we address the effect. Amen’s book is based on 10 key principles about the brain and its relationship with your body, and ultimately the health and wellbeing of our bodies. Your brain is involved in everything you do. It is at the core of your very health and wellbeing and the good or bad decisions we make with our brain ultimately determine whether your stomach bulges over your belt or your waistline is trim and toned. Essentially, the moment-by-moment functioning of the brain is responsible for the way you think, feel, eat and exercise. When your brain works right, your body looks and feels better. Here the idea is that when you have a healthy brain, it’s easier for you to have the best body possible. When your brain is working at optimal levels, you are more likely to stick to a diet, follow an exercise routine and adopt wellness lifestyle behaviours. The brain is a complex organ and we should respect it. The brain is an incredible organ, more powerful than the most sophisticated supercomputer. It is also responsible for our personalities, our character, our intelligence, indeed who we are. Yet often we don’t respect it, with the things we put into our bodies or the lifestyle we live. Your brain is soft and housed in a really hard skull and needs protecting. The consistency of the brain is not firm and rubbery as we might believe but very soft – like butter or custard. Although protected by a hard skull it can still be damaged easily. Many studies indicate that a lot of contact sports can damage our brains and demonstrate that even people who have suffered minor brain injuries can often experience emotional, behavioural or cognitive problems. The brain has only so much reserve. The more reserve you have, the healthier you are. The less, the more vulnerable. In times of stress some people deal with the situation better than others and the conclusion from Dr Amen’s brain scan work is that this is something to do with brain reserve – the cushion of healthy brain function we have to deal with stressful events or injuries. Specific parts of the brain are involved in certain behaviours. Trouble in specific parts tends to cause certain behavioural problems. The brain is divided into various parts or systems. If these parts of the brain show low or high activity (which can be seen with brain scanning) we exhibit certain behavioural problems. By addressing that under or over activity through the use of supplements and lifestyle changes we can help our ability to have the best body possible. Many things hurt the brain and make it harder for you to get and keep the body you’ve always wanted. Many things help the brain and make it easier to get and keep a body you love. Things that harm include: physical trauma, drugs, alcohol, obesity, hormonal imbalances, malnutrition, inflammation of the body, stress, sleep deprivation, smoking, too much caffeine, too much TV, violent video games, dehydration, lack of exercise, negative thinking, and also making the list – excessive texting and social networking on the internet. Brain imaging gives insight into healing the brain so you can have a better body. Brain imaging can often give clues as to the type of issue – from the list above, but also the area of the brain affected, which can then be treated. One prescription does not work for everyone. We are all unique and you need to understand how your own personal brain functions. We need individualised approaches based on our own brain type and needs. You can change your brain and body! Here Dr Amen imagines a really exciting breakthrough in medicine where by targeting specific interventions and lifestyle changes, you can improve both your brain and body. So that’s it, the 10 principles that explain why it is essential to love and nurture your brain to have your best body possible and optimal wellness. Next time, we explore how to use your brain to achieve something many of us struggle with – lasting weight loss; plus the many ways your brain can help you beautify your body and achieve lasting wellness and good health. 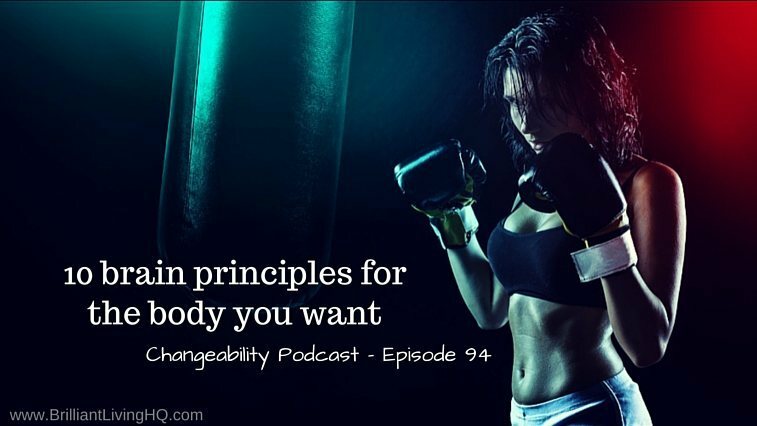 Hear us discuss the 10 principles and more in episode 94 of The Changeability Podcast, or subscribe to all our previous episodes on iTunes.